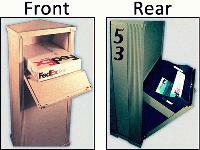 Know that your mail is safe with home Secure Mail & Package Drop Boxes. In this day and age, mail and identity theft is becoming more prevalent. With Janzer’s exclusive custom residential Secure Mail & Package Drop Boxes, “everything that is dropped in… always stays locked in!” No key is needed for deliveries and unlike our “competitor” products, there are no tricky levers to move or trays to adjust, nor is there the added expense or need to hire a mason to build a brick or stone column around this decorative free-standing mailbox. 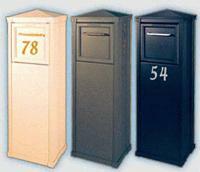 These one-of-a-kind custom residential mailboxes are superior in every way, with its appearance, function, and durability. 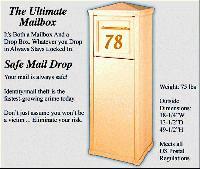 Not only is it a decorative secure locking mailbox, but it is large enough to store several months of mail! So go ahead and travel when, where and as long as you like, knowing that your deliveries will be safe, dry and secure when you return.